Clay is abundant. We tend to think of it as being almost worthless and despite the amount that is used (for everything from bricks to dinnerware), the supply is not being depleted. It is formed by the action of the elements as they break down and erode the surface of the earth. In the process, minute particles of decomposed rock and organic matter are moved by water to low lying areas where clay beds are formed. When clay is moist, it has great plasticity; often it can be used just as it is found. A potter wedges the clay – somewhat like kneading dough – to make it even in consistency and then a pot may be hand-built by the coil method, or “thrown” on a wheel. A potter’s wheel is a simple device. Its top is a flat disc (today wheel heads are made usually from an aluminum alloy) and a shaft connects it to a larger and heavier disc below, a flywheel. The wheel head and flywheel are supported by a frame; attached to it may be a bench for the potter and a table that provides a place for a pail of water, clay, and tools. When making a pot on a wheel, a potter throws a ball of clay onto the wheel head. The hands are lubricated in water and the flywheel is kicked. As the wheel is turning, the hands are braced and placed on the clay to center it; the centered clay then is opened, raised and given form (bottle, bowl, storage vessel, etc). After a pot is trimmed and thoroughly dry (“bone dry”) it is placed in a kiln. The high temperature in a kiln fuses clay particles and hardens the pot. In 1834, William McClure Thomson went to the Near East as a missionary and after twenty-three years in the Holy Land he wrote: The Land and the Book: Biblical Illustrations Drawn from the Manners and Customs, the Scenes and Scenery of the Holy Land. In his book, Thomson wrote about the setting in which Bible stories took place and his son, William Hanna, illustrated the text with over 200 drawings. 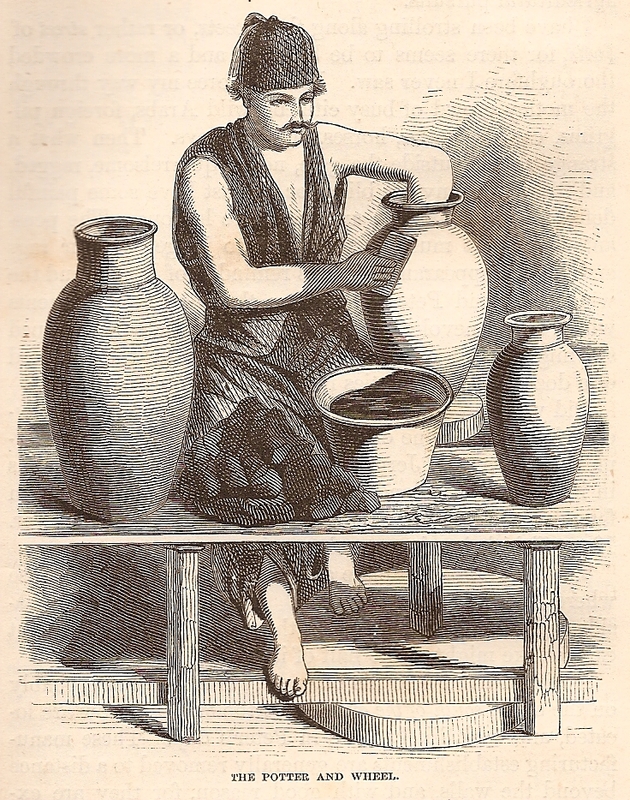 “The Potter and Wheel” depicts a Palestinian artisan giving final shape to a pot that has been thrown. “Throwing” is a process that has not changed for thousands of years and when Jeremiah went to the potter’s house, as directed by the Lord, the potter at the wheel would have been very much like what Thomson depicts in the nineteenth century illustration above. At the time Jeremiah arrived, a thrown pot was still on the wheel; the potter was reshaping it because it was flawed. For Jeremiah, seeing the potter at the wheel was a graphic demonstration. Just as a potter controls clay, the form of nations is in the Lord’s hands.